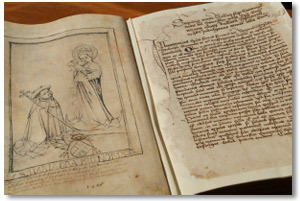 In the Archives of the Cracow Cathedral Chapter there is a manuscript Liber Privilegiorum no 2, containing an ink votive drawing: the oldest survived work of art of that kind in Poland. 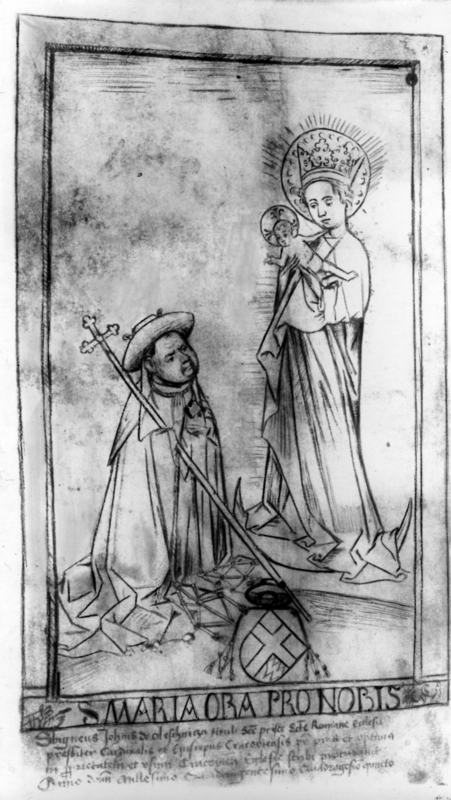 The drawing depicts a donor, which is Cracow Bishop and the firs Polish cardinal, Zbigniew Oleśnicki (1389-1455), worshiping Virgin with Child. The image of Oleśnicki is quite individual; his features are depicted rather expressively, and it seems justified to consider this drawing as a piece of portraiture. The donor wears the cardinal hat and holds a cross; below we may see his coat of arms (Dębno), also covered with cardinal hat. The drawing was created by a local artist, which is proved by the elements of its style (the Virgin’s body is thin and delicate, but her head is comparatively large, of a high forehead and rather big nose). On the other hand, it contains some elements that are characteristic for the Netherlandish art of the 15th century: not only the record of the donor’s actual appearance, but also angular folds of the characters’ clothes and the same scale of the figures of Madonna and the donor. 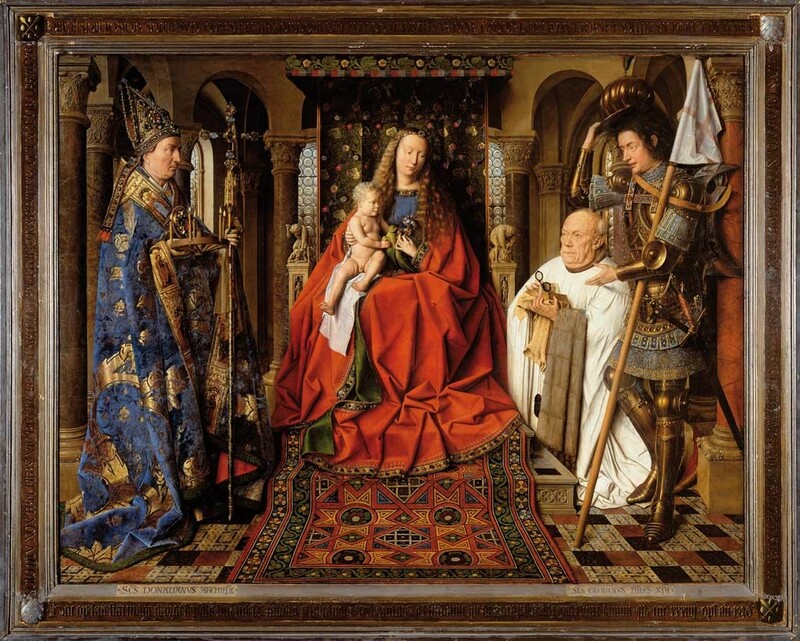 Such a composition may be compared to the famous masterpieces by Jan van Eyck, such as Madonna of Chancellor Rolin (1435, Paris, Louvre), or Virgin and Child with Canon van der Paele (1436, Bruges, Groeningemuseum). Liber Privilegiorum is a book also called a cartulary: it contains copies of legal papers related to the diocese: various privileges, indulgences, or acts of property. This one has been copied for by Oleśnicki; in the lower frame of the drawing we may see an inscription that reads S MARIA ORA PRO NOBIS (St Mary pray for us), and below we have another lines: Sbigneus Joh(an)nis de Oleschnicza tituli s(an)c(t)e Prisce S(an)cte Romane Ecclesie presbiter cardinalis et episcopus Cracoviensis, p(ate)r pius et optim(us), in p(ro)prietatem et usum Cracovien(sis) ecclesie scribi procuravit. Anno d(omi)ni millesimo quadringentesimo quadragesimo quinto. That inscription describes Oleśnicki not only as the bishop of Cracow, but also as cardinal presbyter of the title of St Prisca Church in Rome. Each cardinal presbyter gets such a title (attached to one of the churches of Rome) from the Pope. Subsequently, the inscription gives us a date 1445, and here it gets tricky: in fact, Oleśnicki received the title of the cardinal of St Prisca in 1449! Theoretically, Oleśnicki should not appear dressed as a cardinal prior to 1449, but in fact we do know that he used the cardinal hat earlier, although he should not have done that. Zbigniew Oleśnicki was, as I mentioned above, the Bishop of Cracow and the first Polish cardinal. It was not easy way for him to get those titles though. He was a very powerful and ambitious man, deeply engaged in politics; in fact he became the Bishop of Cracow (the then capital of the Kingdom of Poland!) out of political reasons. Apparently, a day before he became the Bishop (on December 19th, 1423), he quickly took the vows and became a priest, rather in a rush. It was not easy for him to become a priest anyway, because in 1410, during the great battle of Grunwald, he got involved in killing one of the enemy knights. Apparently it was forbidden to become a priest for anyone who shed blood, so Oleśnicki had to get a special dispensation from the Pope. He got that, as the Pope decided that Oleśnicki did not kill the knight himself: he only hit him and made him fall off his horse, but the final blow was delivered by someone else. Oleśnicki very much wanted to be a cardinal, but it was a difficult time to get that dignity. During those years the Pope was in conflict with the Council, and so it seems that for political reasons Oleśnicki decided not to accept the cardinal nomination offered him in 1439 by the Pope Eugene IV. We also know that around that time the Polish king Władysław forbade Oleśnicki to wear the cardinal hat (so he did wear it after all!). In 1441 Oleśnicki was granted the title of cardinal of St. Anastasia – this time it was offered by the anti-pope Felix V. Oleśnicki felt that he should not accept it; he avoided using St Anastasia title, although he called himself “cardinal” in one document of 1442. 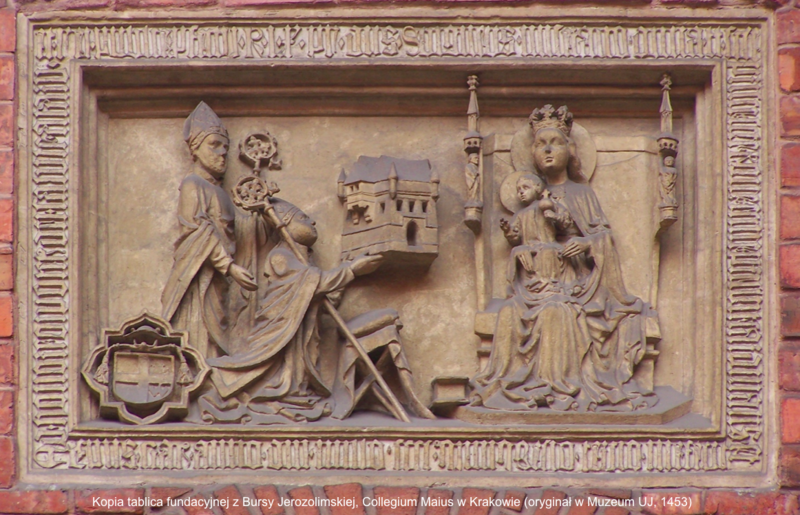 Finally, in 1449, the Pope Nicholas V confirmed the title of St Prisca for Oleśnicki and from that moment the Bishop of Cracow was officially a cardinal. He decorated his subsequent foundations with his coat of arms covered with cardinal hat (he liked to decorate them with his own images, too). So is the date 1445 in the drawing correct, or was it created later, after 1449? 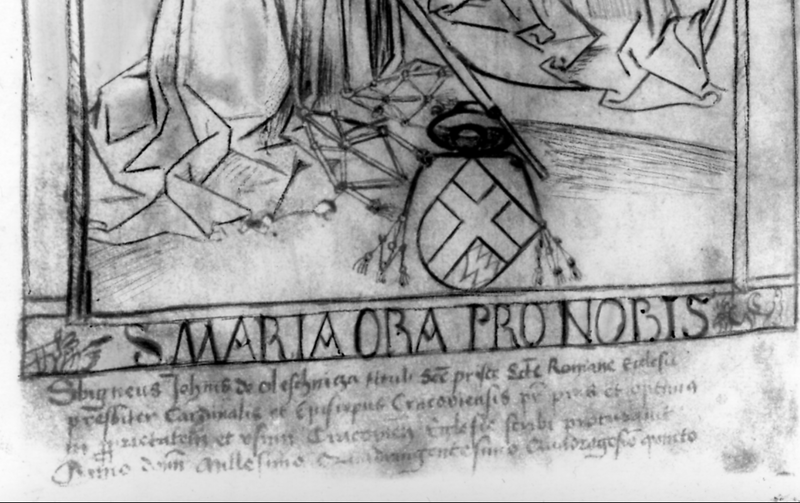 Well, I need to say here that the inscription under the drawing (which describes Zbigniew Oleśnicki as the Cardinal of St. Prisca) as well as the cardinal hat on top of his coats of arms were completed with brown ink of a brighter shade then the ink used in the other parts of the drawing. Unfortunately I do not have a colorful photo of the drawing of a decent resolution, so I’m afraid you need to believe me that this is the case. As a result I believe that the drawing was an integral element of the manuscript created in 1445 and that it depicted Oleśnicki dressed as a cardinal, but it did not contain an inscription or cardinal hat over the coat of arms. Those elements were probably added later, in 1449, when the Pope Nicholas V confirmed the title granted to Oleśnicki by the Pope Eugene IV. This Cracow drawing is a unique work of art: it contains a portrait of one of the most influential figures in Poland in the 15th century. Additionally, it reveals some interesting details about the struggle for cardinal hat of the first cardinal in Poland. It also seems to be influenced by the early-Netherlandish art, and so I believe that its author had a chance to see some examples of contemporary Netherlandish painting. 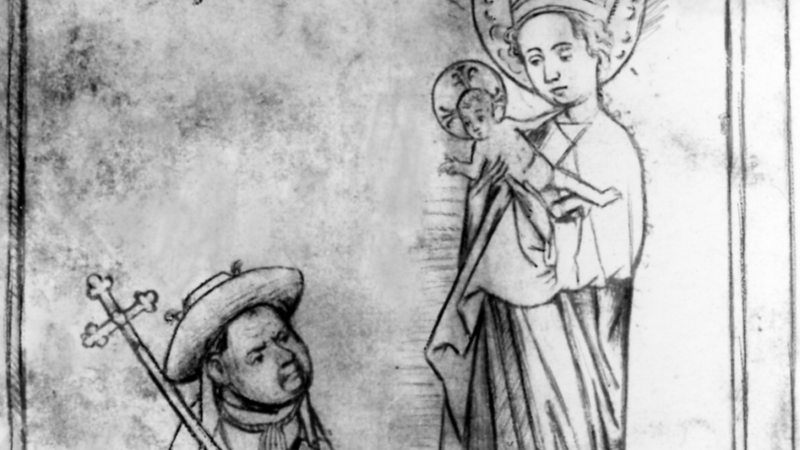 Even the awkward pose and proportions of the Child in the drawing may be juxtaposed to some Netherlandish examples, e.g. 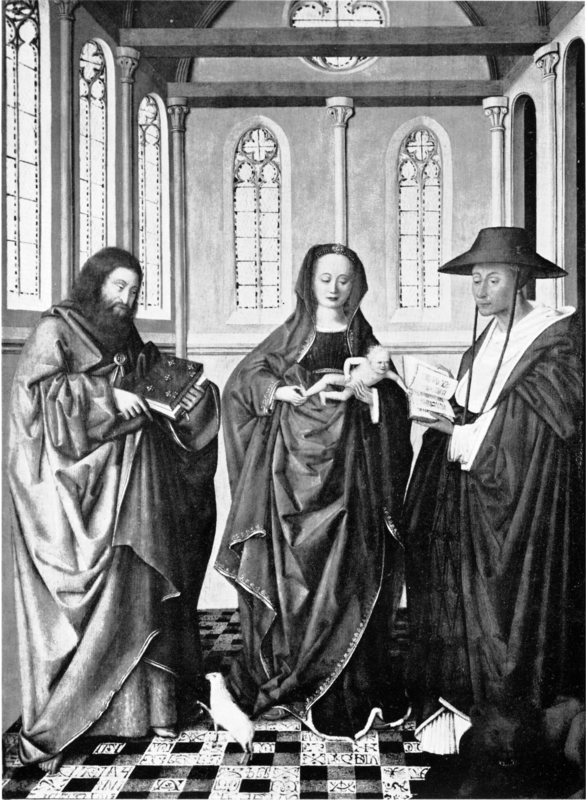 the Virgin with Child, St John the Baptist and St Jerome (1440-1460, formerly Amsterdam, Proehl Collection, currently private collection in The Hague). Unfortunately there are no other works of art in Lesser Poland that we may attribute to the author of this drawing. I have researched the drawing earlier and a further analysis (including more comparisons) is described in my paper Rysunek w Liber Privilegiorum nr 2 katedry krakowskiej, [in:] “Działalność fundacyjna biskupów Krakowskich”, red. M. Walczak, Kraków 2016, vol. I: pp. 503-512; vol. II: pp. 191-195 (in Polish, but with English summary; PDF available on-line: Liber_Privilegiorum).